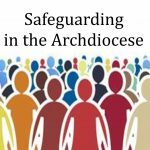 Parishes, schools, and chaplaincies that have the support of religious communities living amongst them are enriched. 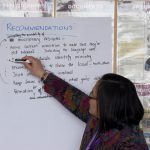 These stories are just some of examples of the many good works undertaken by religious through prayer, hope, retreats, education and other professional activities and support for people everywhere. On Sunday February 12 Cardinal John Dew celebrated Mass Ss Peter and Paul Church in Lower Hutt, where he came to present a Benemerenti Papal Medal to Marist Brother Doug Dawick fms. The medal recognises services to others done in the name of the Gospel. Cardinal John spoke about Br Doug’s contribution to the Church over the 60 years of his religious life – in schools, Loreto Hall Teachers’ College, Marist Brothers’ formation centres, and Catholic education in Fiji. 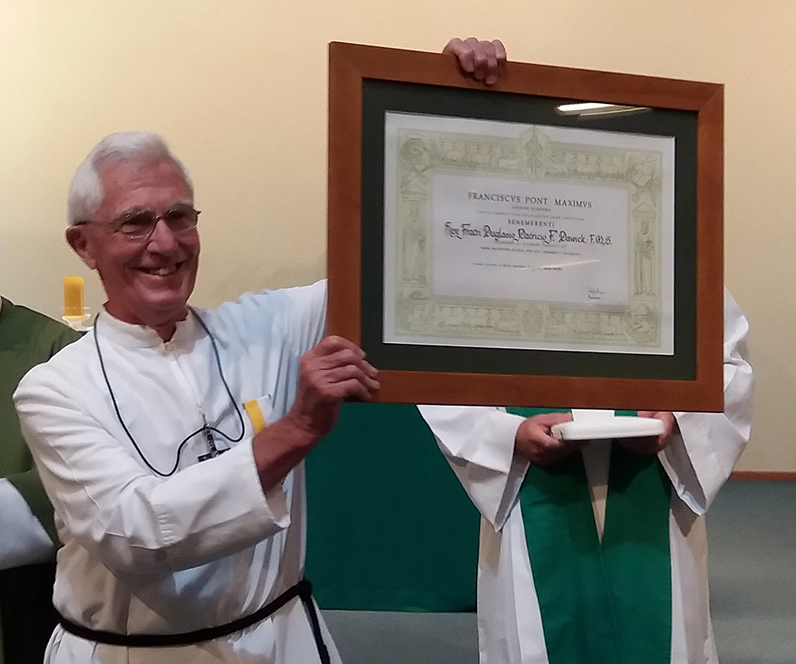 Br Doug was humbled to receive the medal and said there were many others more deserving of such an honour, but he was accepting it in the name of the Marist Brothers who had worked in the Wellington Archdiocese since they opened the first school in Wellington in 1876. Marist Brothers have worked in Miramar, Newtown, Thorndon, Lower Hutt, Masterton, Palmerston North, Whanganui and Napier. The Benemerenti papal medal was originally awarded to soldiers in the papal army from around 1790. In 1925 the award was extended to those in the service of the Church, both clergy and laity. Many Sisters of Mercy, families and friends joined in a recent celebration to mark a Golden Jubilee of vowed Mercy life. On 21 January 1967, Srs Mary Hepburn, Stephanie Kitching and Frances Feehan took vows of Poverty, Chastity and Obedience in St Mary’s Convent Chapel, Thorndon. Now, 50 years later, they are still rejoicing in their lives as consecrated women. 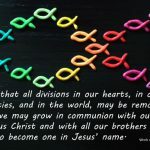 Their love of Jesus in Mercy has taken them to distant places in their ministry – the length of Aotearoa, South America, South Africa and Samoa. The spiritual and corporal Works of Mercy have been their intent. As Sr Elizabeth Julian said in her reflection for the occasion, ‘Let our prayer today be of thanksgiving for the fruit these women have borne, and for the remarkable generosity, fidelity and commitment of their lives.’ May their future be blessed. Pictured at the jubilee celebration, from left are: Sr Frances Feehan sm, Sr Mary Hepburn rsm, Mrs Mary Neazor, and Sr Stephanie Kitching sm. To become an oasis of peace and a beacon of hope in Palestine are just some of Bethlehem University’s aims, Vice Chancellor Brother Peter Bray told a Wellington group during a talk he gave last month while visiting New Zealand. The New Zealand De La Salle brother spoke to more than 50 people at Wellington’s Connolly Hall about Bethlehem University and the situation in Palestine. Br Peter shared how quality higher education in an oppressive situation goes hand-in-hand with relationship-building between Muslim and Christian students at the university. The university was established at the request of Pope Paul VI in 1964 as the first university in Palestine, and the only Catholic university in the Holy Land. It has about 30 per cent Christian students, and 70 per cent Muslim in a region with a Christian population of less than two per cent. ‘Some people talk of Bethlehem University as the second star of Bethlehem. It attracts people. It enlightens people. It guides people, and that’s what we are doing,’ Br Peter said. Br Peter shared video footage of young students talking about the difficulties of spending hours making their way through Israeli barriers and checkpoints – and sometimes being turned away – just to get to school; as well as their hopes for justice, and that one day they will be able to travel freely to the sea, just 30 kilometres away. Since 2009, Caritas Aotearoa New Zealand has partnered with the university to support the development of educational opportunities and allow New Zealanders to contribute to the financial support of students there. The social-justice agency is currently supporting a programme that includes training students in small business management. 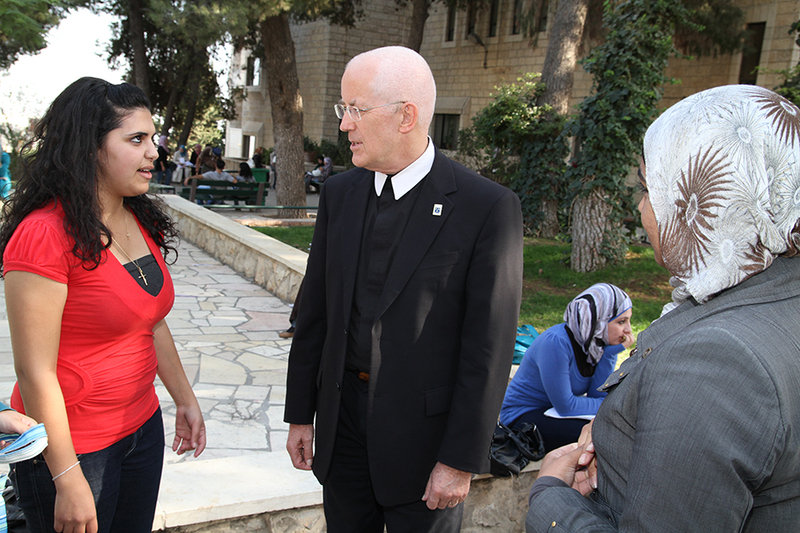 Students and Br Peter Bray on campus at Bethlehem University in Palestine. At the end of last year our Cenacle Retreat in Daily Life team gathered at the Cenacle at Olliver Grove in Waikanae to reflect on our ministry and to prepare for the year ahead – aware of many uncertainties and vulnerabilities people face: earthquakes, floods and the consequences for buildings, dislocation of communities, jobs, insurance costs, health and housing concerns, social and spiritual loss and global uncertainties. Looking back on 2016 we felt gratitude for the participants who had committed themselves to a week of guided prayer, and resolution by praying the Gospel in the midst of everyday life. Some said ‘wrinkles fell away’, there was the ‘thrill of discovering the person of Jesus in a new way’ or ‘I was aware of changes in myself as I went to my job as the retreat progressed; I became less protective of my own time and more generous to others at my work’. Our retreats are an adaption of the Spiritual Exercises of St Ignatius Loyola and continue to be a powerful experience in people’s lives. We feel privileged to enter and be welcomed into the faith community of a parish, and accompany people in a retreat ‘in the midst of life’. We invite you to consider taking part. a day or evening reflection on ‘Being Human in a Time of Uncertainty’. Retreat team members are Margaret Butler op, Merle Hiscock rndm, Graham Millar, Cenacle Companions Mrs Ronnie Parton and Mrs Merle Whiteman, and Cenacle Sisters Mary J Kay rc, Clare O’Connor rc and Anne Powell rc. Please contact Srs Clare O’Connor or Anne Powell for more information at email office@cenacle.org.nz or phone (04) 905-7213 or visit our website (www.cenacle.org.nz). Fr Manoj Mathew ic (a Rosminian) is pictured left receiving ‘welcome’ flowers after celebrating his first Sunday Mass at St Mary’s Church in Palmerston North earlier this year. Fr Manjo has been on the move in his ministry. He was ordained as a priest in October 2011 after which he was appointed as rector of the formation house in India. The following year he worked as an assistant priest in Kerala and a year later he became the pioneer priest to work in Mumbai. In September 2015 he began work in the Diocese of Palmerston North as a pioneer priest then moved to Hastings for just over a year, where the parishioners loved him. 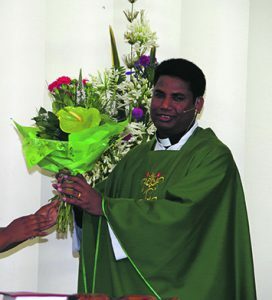 Now Fr Manoj is back in Palmerston North at St Mary’s Parish where his leadership will bring many blessings.